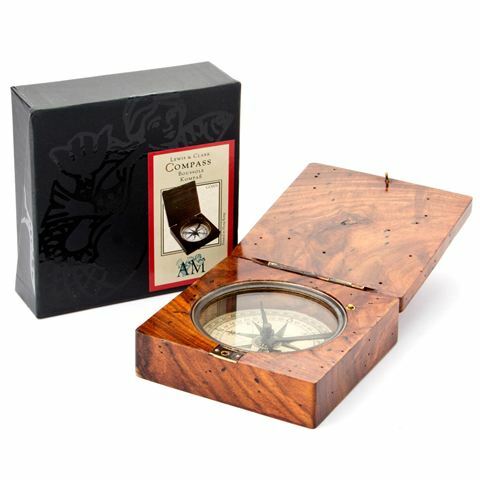 This special Lewis & Clark Compass from Authentic Models looks so ancient and rustic, you can't help but feel that it has been along for some amazing adventures to the far flung corners of the Earth. This compass is the exact replica of the one adventurers Meriwether Lewis and William Clark took on their Corps of Discovery Expedition around the US. In a protective wooden case, you can imagine this compass as a trusty companion to these curious wayward travellers. Made from glass and wood with a beautiful rustic bronze trim. Held in a protective wooden case with a lid. Dimensions of wooden box: 8.5 x 8 x 3cm.